Today I was holding the baby, making lunch for the girls, doing hair, shouting for them to find their shoes, talking on the phone, and eating the crust off their sandwiches (way more effective than slicing it off) - all at the same time. After slugging around for the past few days, I definitely felt off my game, and realized I was struggling when I starting feeding the baby an empty bottle. 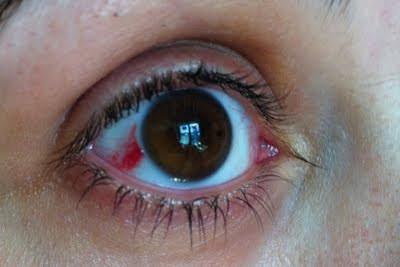 As I was shoving Hadley out the door for Kindergarten, she says to me, "Mom, what's wrong with your eye - its bleeding!" I looked in the mirror. Holy hell, she was right. There is was. I had always suspected that raising these hooligans might kill me. Now I have proof. I better calm down. I’m starting to bust out of more than just my pants.